Thoughts on how living simply allows us to travel the world full-time, and enjoy more experiences, expensive foods and more...all in exchange for low monthly bills and never needing to clean out the garage. We’re coming into the 11th month of our traveling outside of the US for a year. We want to travel the entire world. Australia and Europe by van. A sailboat someday maybe. Being away from the US is no big deal to many a traveler, but I’d be lying if I said I always love it. I’m a big imbiber of IPAs. When autumn comes, I like to watch the Steelers disappoint me every other weekend. Forested mountains and glacial rivers, autumn leaves and long back roads to great little burger joints in small towns, these are the things I miss living without. We already live quite small. 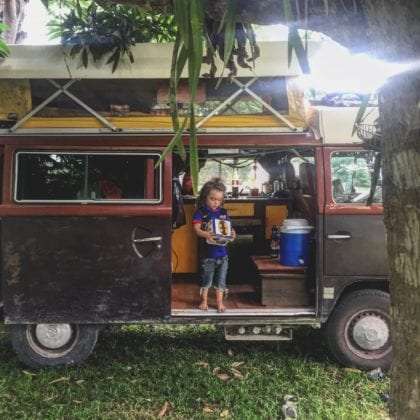 A VW Bus as our home, three boys, their mama and I packed inside. Car insurance, a few cell phone bills, an inexpensive life insurance bill…these are our total monthly expenses. Our fridge is a few cubic feet. We get by on a two burner stove. I own two pair of pants. It’s minimalism, and it’s what has allowed us to travel so far for so long. I work for a living and do well, but by no means are we rich. Living with little makes a fortune unnecessary. It opens your budget up to experiences. For example, for the past two weeks we’ve been able to afford to live beachside in a tourist town in Belize. The kids eat simple meals which leaves enough cash for Renée and I to go out after the younger two are asleep for sangrias at our favorite bar here in Placencia. Living out of our Bus made it possible to spend four months touring around Baja practically for free (boondocking is plentiful in Baja California, Mexico, and campgrounds with hookups often come in at as little as $10-$15 dollars per night). In the US, we learned to keep our rent down to around $200 / month when we spent most of our time in BLM land and national forests. All of this means more money for the things we enjoy…those good beers, eating at restaurants a few times a week, buying nature books and renting the occasional movies. We could have a big house (or small, for that matter) in any of many towns we love around the US. We’d spend more to see less. Life is full of trade offs and, for us, the biggest reward is trading stuff for living with little. Having less has given us all we ever really wanted…to travel around with our kids, see the world from a new perspective as often as feels appropriate, and take control of our time.